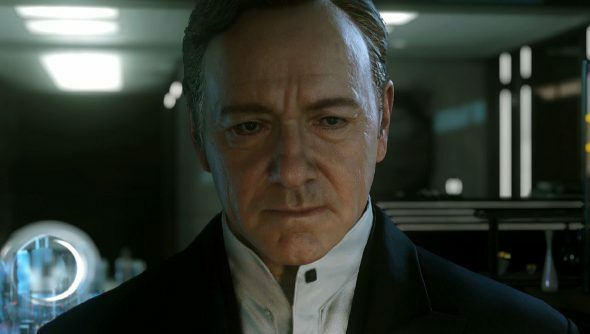 Call of Duty: Advanced Warfare has a bit more riding on it than previous installments in the bloated franchise. Call of Duty: Ghosts was a low point for the series, and Sledgehammer has been making a point on emphasising the changes they are bringing to the shooter. There’s the script that took over two years to write, the authenticity, the new tech and even Kevin Spacey’s entire body. But some things never change. Advanced Warfare will, of course, come with a season pass, premium DLC and not one, not two but three collectors editions. Conveniently, you won’t have to struggle to pick between them, because there’s not a huge difference other than one of them being digital only and two of them including the season pass. The Atlas Pro Edition pack (£99.99/$119.99) will make you feel like you actually work for Kevin Spacey’s PMC. You’ll get all the benefits of being part of an unregulated international army like a dental and medical plan and the ability to shoot people without consequences a season pass, a bonus multiplayer map and, Atlas guns, an Atlas exoskeleton and some books. If you’re not pro, you might instead want to pick up the Atlas Limited Edition pack (£69.99/$79.99). It’s exactly the same as the Pro Edition, but doesn’t come with a season pass. For some reason, you might hate material goods. Maybe you hate freedom too. That doesn’t mean you can’t be professional mercenary though. You can pick up the Digital Pro Edition (£89.99/$99.99), which is the same as the Atlas Pro Edition apart from the lack of books or the soundtrack. Who has time to read, anyway? Would you lovely lot splash out on these? What if Kevin Spacey ordered you to?